Question: I know it’s not possible to explain it in brief, but could you please mention what are the spiritual practices that will help us to purify our consciousness? Swami Tirtha: Very good question, thank you! We have one very beautiful book here, this is the Bhagavad Gita. This is so important in the Indian philosophy just like the Bible in our country. And here we find some suggestions concerning your question in the Twelfth Chapter. This book is like a discussion between God and one of His beloved servants. Krishna, God is speaking here and His friend Arjuna – Arjuna is a fighter and they are in front of a war. Arjuna, the fighter, inquires: “What to do? What is the proper action?” Then Krishna explains him everything about the proper action, eternity of the soul, about karma – the action-reaction law. And later on Krishna will say what the perfection of life is: “Just ﬁx your mind upon Me, the Supreme Personality of Godhead, and engage all your intelligence in Me. Thus you will live in Me always, without a doubt.” As you asked what the best spiritual practices are, here you will find the answer – the best is if we can always think of God, always be united with Him, always live in Him. Is it easy? Swami Tirtha: It’s very difficult. Krishna knows this, therefore He gives a second alternative: “My dear Arjuna, O winner of wealth, if you cannot ﬁx your mind upon Me without deviation, then follow the regulative principles of bhakti-yoga. In this way develop a desire to attain Me.” So if you cannot permanently focus your consciousness in deep meditation and deep absorption in God, then follow the regulative principles. Shall I tell you some? Swami Tirtha: Ah! It’s a long list. Avoid violence. We can practice it if we have this very nice, very healthy vegetarian diet – there is no violence in your energy input. Then try to avoid intoxicants. Then try to be fateful to your partner. And try to avoid mental disturbance – like speculation and hazard. Fortunately there are four positive principles also that should be followed and these are satyam, daya, tapa, shaucham. Satyam – tell the truth, be truthful; daya – be merciful and compassionate; tapa – lead a simple, renounced life; and shaucham means purity, be pure – in your body, in your mind, in your actions, in your words. Is that easy to do? 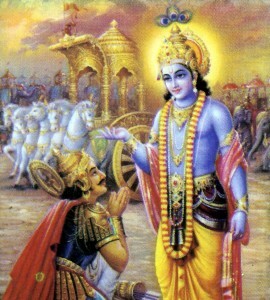 Our God is omniscient, He knows that even that is very difficult for the human beings, therefore He gives another alternative: “If you cannot practice the regulations of bhakti-yoga, then just try to work for Me, because by working for Me you will come to the perfect stage.” So, if we dedicate all our activities to the divine cause, if we want to work for the happiness of God Supreme, then it will automatically bring you to a higher level. But all activities should be dedicated to the Supreme. Shall I ask you again: is it easy or not? The next verse says: “If, however, you are unable to work in this consciousness of Me, then try to act giving up all results of your work and try to be self-situated.” That means selfless actions. Be ready to help others, share what you have, be a real human being. This is a very nice feature – if we learn to share what we have. So here we have a beautiful structure – how to practice, where to start. You can start with knowledge. And spiritual knowledge means that you differentiate between material and spiritual. It’s very important to distinguish what is what – this is permanent, this is impermanent. Then the next step is meditation. Meditation is very popular these days. If a young man sees a beautiful young woman he says: “Ah, I meditate.” But this is not meditation, my dears. Meditation is when you connect your consciousness to the supreme consciousness, to charge yourself with these spiritual powers and vibrations. Then selfless activity is the next step. And then dedicate your activities to God directly. Then the higher plane is to follow these very important principles. And finally you can reach your permanent absorption in divine consciousness. But if we want to be more practical… for maybe this is too general for you – I tell you what I do in the mornings, good? We rise early, we have a little ceremony in front of our altar – we offer some flowers, some incense, some other articles to God – then we sing spiritual songs – this helps you also to come to that higher platform; and then we have our private personal meditation – like prayers and chanting mantras. And if you have Bhagavad Gita at home, it’s very good to read at least one verse every day. If you can find, let’s say, half an hour in the morning, this is very good for spiritual practices – to pray, to read, to study, to meditate a little bit. Then you can start your day and you will see the difference. If we can start our day in this mood, it will be a very peaceful and very fruitful day. And if you want to check yourself whether you have maintained your consciousness during the day, in the evening again you should look into yourself: what did you do, what you didn’t do, what did you miss and what did you gain. This is enough to start.